When my in-laws came to visit us, we would often explore the aisles of a Latin-American Grocery Store for different stem and root tubers. My father-in-law found these Malanga roots during one such visit. Malanga is also known as Yautia, Cocoyam, Eddo, Coco, Tannia, Japanese Potatoes and so on. 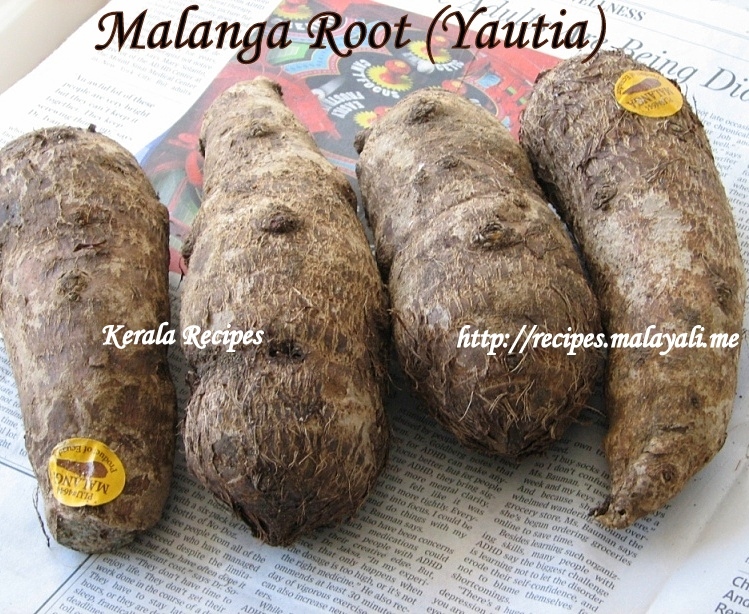 Malanga Root is related to a similar tuber called Taro (Colocasia esculenta). Taro is known as Chembu in Malayalam and Arvi/Arbi in Hindi. Both Malanga and Taro roots look similar and is often a cause of confusion. However, the leaves of both plants are different. Taro belongs to the Colocasia family whereas Malanga belongs to Xanthosoma family. To add to the confusion, both Malanga and Taro are not roots but underground stems (corms). Unlike Malanga, Taro contains certain irritants which can cause skin rashes. Taro should always be thoroughly cooked to prevent a allergic reaction. Wear a gloves while handling Taro. We tried Malanga Root number of times and we found the taste to be exactly the same as Taro (Chembu). The easiest way of preparation is to peel the skin and boil the root. 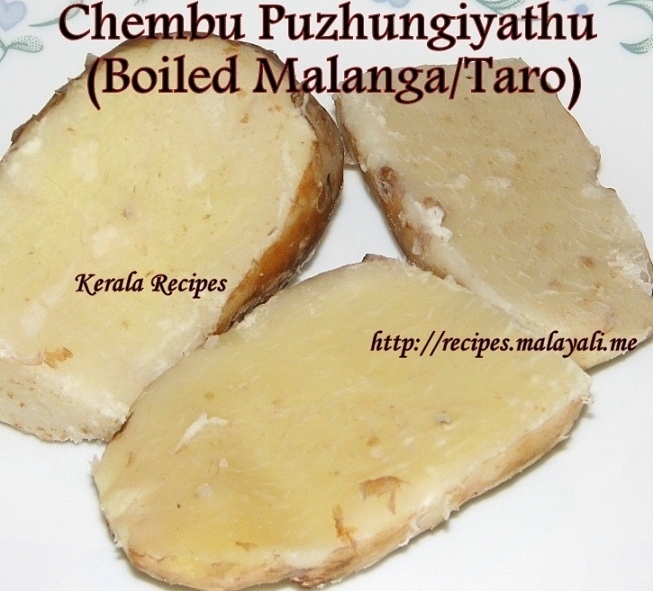 Enjoy the Boiled Taro/Malanga (Chembu Puzhungiyathu) with a spicy chilly-shallot dip. Peel the skin from the Malanga root and wash it thoroughly. Chop each root into 4 or 5 big pieces. In a large pan, boil the Malanga in salted water until tender but firm. Be careful not to overcook the Malanga. Grind shallots, green chillies and tamarind to get a coarse paste. Alternatively, you can use a Mortar and Pestle. Add salt to taste and and top it with a teaspoon of coconut oil. Mix everything nicely and serve with Malanga or Taro.